WhatsApp, a tiny startup with a very basic idea, boring design and lots of competition, has somehow managed to connect up most of the world. And that’s actually pretty exciting. The four-year-old company — which helps users send text messages between all different types of mobile phones on all different carriers in every country — now has 300 million monthly active users, it told AllThingsD this week. That includes more than 20 million active users each in Germany, Mexico, India and Spain. WhatsApp users now send 11 billion messages and receive 20 billion messages per day (counted separately because some messages are sent to more than one recipient). That’s up from 27 billion total in June. Not to go overboard with stats, but WhatsApp has 70 percent penetration across the entire population of Brunei — not even limited to residents who have smartphones. Similarly, it has 50 percent penetration in Hong Kong. Have you heard about how the fast-growing Snapchat app now transmits 200 million disappearing photos per day between its users? 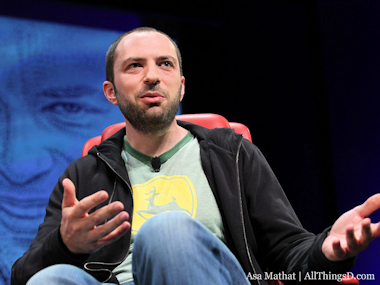 Well, WhatsApp users share 325 million photos per day, according Jan Koum, the company’s co-founder and CEO, speaking in an interview at WhatsApp’s unmarked office housed inside another tech-related business near Castro Street in Mountain View, Calif. So what’s next for WhatsApp? Is it mobile payments, or an app platform, or something mind-dazzlingly audacious? Nope. It’s push-to-talk voice messaging. 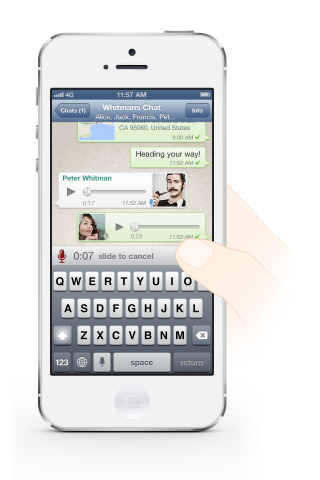 WhatsApp’s voice messaging feature was a carefully designed “pet project” of Koum’s over the past six months, he said. Sure, other mobile messaging apps have voice features already — it’s the main draw of Voxer, for example. Koum’s contention is that WhatApp’s innovation is in how simple it makes sending a voice message. He pulled out the Facebook Messenger app to show that it takes three taps to make a voice recording. 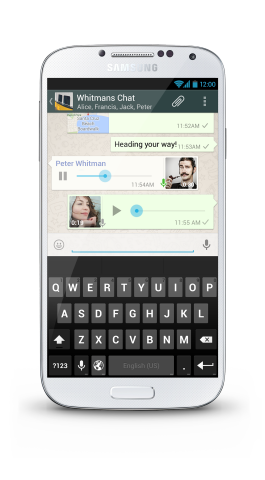 With the updated WhatsApp, a user pushes to record a message rather than type one. When she lets go, the message sends. If she decides not to send, she swipes to the left and the recording is deleted. All that is built into a single tap. “The number of taps matters. People want to send a message and be on their way,” Koum said. Other features: There’s no length limit for the time spent recording, and the volume automatically switches from speaker when held at arm’s length to soft when held next to an ear. There’s also a blue microphone illustration that indicates when a message has been played. “It’s very reassuring to know that someone else has heard your message,” Koum said. Other major mobile app companies like Google and Facebook and Twitter regularly stagger their releases, with different teams working on different platforms, and different prioritization. But WhatsApp — with just 45 employees — is pushing new voice features simultaneously on all its platforms, its first such parallel release. It’s expected to be available to all users within 24 hours. But what’s the big deal with voice? Why is this important, aside from the fact that all 300 million WhatsApp users are getting access to it at the same time? Voice messaging will be especially important for many WhatsApp users whose languages can be harder to type. For instance, Koum said he has many friends that he corresponds with in Russian. It can be difficult because the Russian alphabet has 33 letters, which get compressed into narrow buttons on a touchscreen. Now that won’t be an issue, because he can just send them voice memos. After voice messaging rolls out, Koum said he expects to turn his attention to more “media-focused” products, building on all the photos WhatsApp users are already sending. Continuing to evolve WhatsApp will be crucial, according to Guy Rosen, CEO of Onavo, which gets insight into how people actually use mobile apps by tracking their data access. 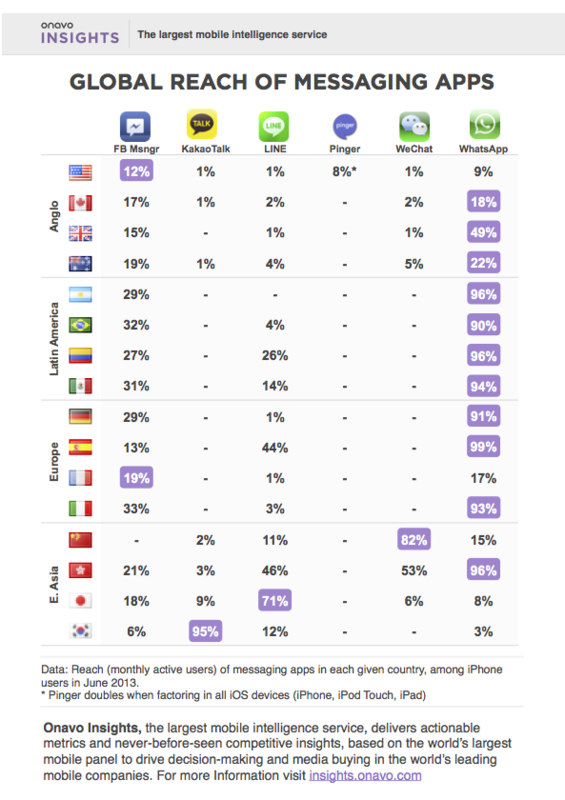 Onavo, which doesn’t measure carrier text messaging or iMessage, provided some stats about the competitive market for messaging (see below). WhatsApp looks to be winning, but others are ready and waiting for it to fall. So what’s the business opportunity for being a messaging company? WhatsApp charges $0.99 per year, after the first year. It doesn’t disclose what percentage of users have paid so far. But as you might remember from our D: Dive Into Mobile conference in April, to have a conversation with Koum is to hear about how much he hates ads. During the Santiago de Compostela train disaster in Spain last month, a woman buried in rubble was able to text her husband her whereabouts using WhatsApp. It became part of the larger narrative around the tragic, deadly event.